“Field research” projects often require scientists to endure discomfort and danger to get where they need to be, but not many can trump this summer’s expedition to what may be the world’s most inaccessible human fossil site, a cave in the foothills of Romania’s Carpathian Mountains. For the seven-member team, the hazards of reaching the site, accessible only by diving through frigid underwater passages, were worth it. Their finds may help answer some of the most hotly debated questions about early humans: Did they make love or war with Neanderthals? Were Neanderthals intellectually inferior to our human ancestors? This may be asking a lot of the scanty fossil remains of three individuals who lived 35,000 years ago, but their age makes them the earliest modern humans ever found in Europe. The uniqueness of the site, which was discovered in 2002, was motivation enough for the specially trained team to devote a month of cold and dangerous underground journeys to reach and excavate the site known as Pestera cu Oase -- Cave with Bones. The team included a Portuguese shipwreck diver and archaeologist, a French Neanderthal specialist, a Romanian cave biologist, and the three Romanian adventurers who discovered the human fossils while exploring submerged caves. At the start of each day’s nine-hour excursion underground, team members stepped into a frigid mountain river that flows into a cave, their helmet-mounted lights piercing the perpetual fog of the cave’s 100 percent humidity. As the equipment-laden crew sloshed past stalagmites, the cave narrowed and the air temperature plunged from the 90s to the upper 40s Fahrenheit. Further in, the ceiling lowered until they were forced, first, to swim on their backs and, finally, don their diving masks and enter a narrow, 80-foot-long underwater passage called “the sump.” Underwater visibility was about three feet. When Milota first told biologist Oana Moldovan in 2002 that he had found a human jaw in a closed-off chamber, Moldovan wanted to see for herself -- even though she had to learn to dive to do it. Surfacing inside another chamber, the divers peeled off their wetsuits and changed into warm clothing. The next step was climbing “the pit,” a series of underground cliff faces that the cavers scaled in dizzying climbs up a succession of ladders they had carried in earlier. Finally, to reach the gallery of bones, they passed through “the gate,” an opening that Milota had first spotted when he felt warmer air emerging. He and his explorer friends widened it just enough for the thinnest of them to squeeze through. Each day, the cavers had to plunge head-and-arms first at a slight uphill angle, then wriggle and rest, wriggle and rest, to cover the final, winding 10 feet. Inside the final gallery, there was room for only three workers at a time because the rest of the floor was covered with thousands of fragile fossils. Most belonged to a cave bear species that became extinct 10,000 years ago -- animals almost twice as big as today’s bears. The original entrance caved in long ago, sealing off the galleries from the outside. After two labs independently yielded radiocarbon dates of about 35,000 years for the jaw, or mandible, that Milota had found, more scientists took interest. 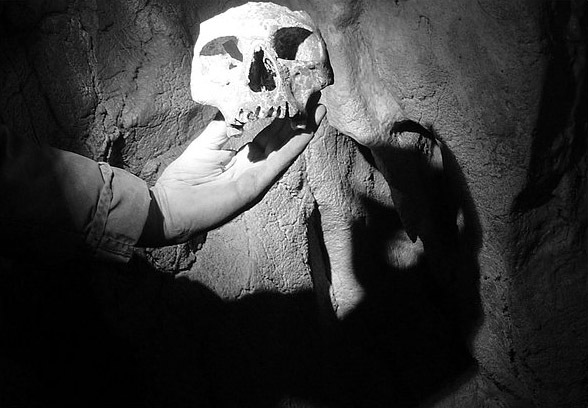 In a 2003 expedition, they found a full face and an ear region of a skull from two more individuals, with puzzling traits that suggested a mix of Neanderthal and human features, something scientists had thought impossible. Anthropologist Erik Trinkaus of Washington University in St. Louis and Joao Zilhao of Cidade University in Lisbon joined this summer’s excavation to look for more specimens and to try to find out how the human remains got into the cave. Because they turned up no sign of torches, charcoal or tools, they concluded that the human remains had washed in through fissures. The biggest payoff of the summer was the discovery of more fragments of the three individuals found earlier, which added to the evidence of hybrid traits. Trinkaus said the Oase fossils show features of modern humans: projecting chin, no brow ridge, a high and rounded brain case. But they also have clear archaic features that place them outside the range of variation for modern humans: a huge face, a large crest of bone behind the ear and enormous teeth that get even larger toward the back. The team considered whether early humans might have interbred with other hominids with Neanderthal-like features, but “in this time period,” said Trinkaus, “the only archaic humans those modern humans could have interbred with were Neanderthals.” The mosaic of Neanderthal and modern traits remind Trinkaus and Zilhao of similar traits they found in a 25,000-year-old fossil of a child in Portugal. Researchers pondering why the Neanderthals died out have speculated that early humans might have killed them off, and Zilhao said the signs of interbreeding do not exclude that possibility. “We know that even when people fight, the winner might kill the males and keep the females from the other side,” he said. The signs of interbreeding challenge the standard wisdom that Neanderthals were a distinct, less intelligent species. Six years ago, Zilhao and Francesco d’Errico of the University of Bordeaux published evidence that Neanderthals independently invented and used personal ornamentation. Zilhao said these finds have changed the view that Neanderthals were an inferior species.